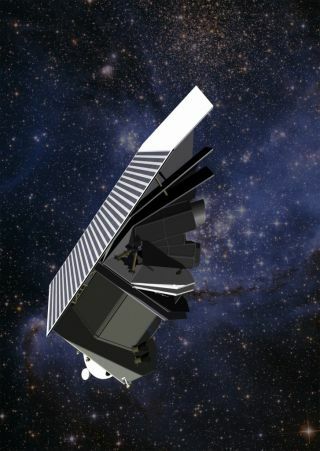 Artist's Illustration of the B612 Foundation's Sentinel mission, which will search for potentially dangerous near-Earth asteroids. Two astronauts are now auctioning their personal space artifacts in a bid to help protect the Earth from asteroids. Apollo 9 spacewalker Rusty Schweickart and International Space Station flight engineer Ed Lu have put up for sale flown-in-space mission patches, flags, medals and pins to support the launch of the private Sentinel space telescope designed to discover, map, and track asteroids with orbits that approach Earth and therefore are a risk to humanity. Apollo 9 astronaut Rusty Schweickart's flown-in-space American flag is being auctioned to help fund the B612 Foundation's space telescope to detect, map and track asteroids. The eBay auction began on June 27 and runs through Sunday (July 7). All eight lots offered — five from Schweickart and three from Lu — can be viewed and bid on through b612auction.com. Schweickart, who launched in March 1969 on the Apollo 9 mission to test fly the lunar module that later would land Americans on the moon, contributed to the auction a 4 by 6 inch (10 by 15 cm) American flag that accompanied him in Earth orbit for 10 days. He is also auctioning two silver lapel pins in the shapes of his two space vehicles, dubbed "Gumdrop" and "Spider," among other memorabilia. International Space Station astronaut Ed Lu's Expedition 7 patch launched on a Russian cargo freighter in 2003 and returned to Earth on space shuttle Discovery in 2005. Lu is offering three embroidered patches, one each carried on his three spaceflights. One of the badges, representing Expedition 7, launched on a Russian cargo freighter to the International Space Station and landed on NASA's space shuttle Discovery after circling the Earth 12,700 times. The auction coincides with the one year anniversary since the B612 Foundation announced its plans for the Sentinel infrared space telescope to catalog 90 percent of the near Earth asteroids that are larger than 460 feet (140 meters). The $450 million mission is slated to launch in 2017 into a Venus-like orbit around the sun. In April, the B612 Foundation said it had raised $2 million toward the Sentinel mission. The astronaut artifact auction hopes to advance that total. "Both Rusty and I were privileged to see the Earth as few others have, and that experience has convinced us that there is nothing more important than the B612 Sentinel mission," explained Lu, "simply because there is no more important mission than protecting our home planet." For more about the Sentinel mission, or to bid in the B612 Foundation's auction, see: b612auction.com. Follow collectSPACE.com on Facebookand on Twitter at @collectSPACE. Copyright 2013 collectSPACE.com. All rights reserved.